I've been talking a lot about Anki's products over the last few months. It started with Cozmo, which is giving the NES Classic Edition a run for its money in the battle for top toy supremacy this holiday season. 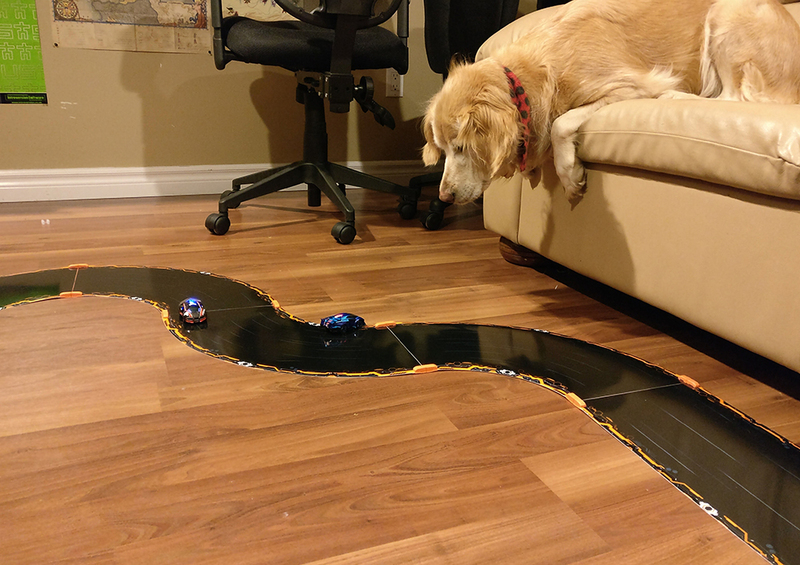 After I had learned about and fell in love with Cozmo and Anki, I discovered their other AI-powered product, Overdrive. Overdrive, as I have explained it, is akin to a Hot Wheels track on steroids combined with Mario Kart. It is app enabled and AI driven. It is also loads of fun! 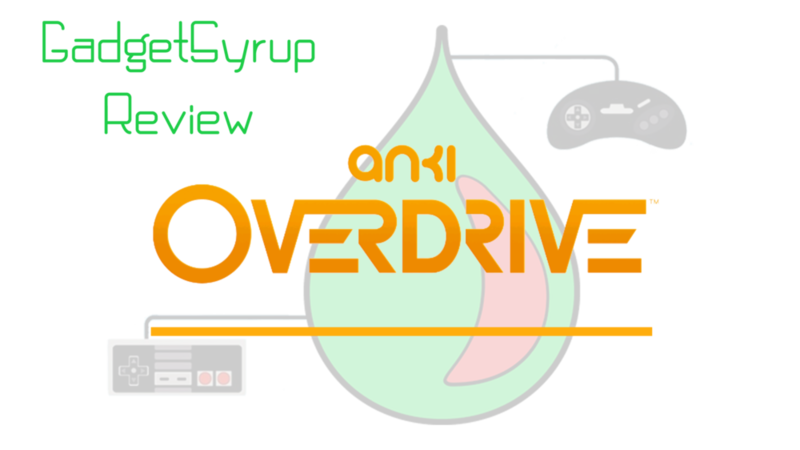 Thanks to the folks at Anki, I have now had the opportunity to test out the Overdrive Starter Kit. Read on for the full review! Relax, Brad. It's just a race track. Inside the Overdrive starter kit, you will find the following. The Overdrive app is available on devices running iOS 8 and up, and Android 5 and up. So how exactly does artificial intelligence drive this "toy"? Well, you have a lot of input, and control over your own Supercar, but the cars you are racing against will use their AI to scan the track, allowing them to set the best racing course. Your opponents also use AI to understand your racing habits while it plans out how to track you down and disable you. Each car and virtual commander can consider more than 50,000 possible actions to defeat you on the track. Anything from zipping around you on the last turn or disabling you with a flurry of weapon attacks from the onset of the race. Each car has a unique set of attributes and arsenal of weapons to use during a race. Skull, for example, is not the quickest Supercar, nor does he have the greatest defense, but his firepower packs enough of a punch to take down nearly any opponent. Whereas, Ground Shock packs a lot less firepower but can use his speed to stay far enough ahead to avoid weapon blasts. After setting up the track, which clicks together using magnets, you are ready to go. Launching the app on your phone or tablet then prompts you to place your Supercars on the charging base so they can sync with your device and perform any needed updates. Once that it is out of the way, the app will prompt you to place the cars on the track and choose from one of the following game modes. - Tournament - Battle the AI through various challenges. Take them all down to win! The controls of the app while racing is very easy to figure out. My only gripe with the app was that I could not flip the controls horizontally on the screen. I was forced to use my left hand to control my cars speed. I would have preferred to flip it, giving speed controls to my dominate hand. Before you start racing, each car needs to learn the track configuration you have setup. To do this, the Supercars are equipped with dedicated CPUs and IR camera scan the specially coated track 500 times per second. The cars will now know exactly where they are on the race track. Once the track scan is complete, this is where the real fun began for me. The race to an observer may be rather boring to watch, but being in control of one of the cars is a lot of fun. You start off at full speed and jump ahead of your opponent, only to look down and see your being pulled in by a tractor beam. Once you've been reeled in, you are now under fire from a short range missile attack. Firing back with your tractor beam brings your opponent back into range will allow you to take them down with something like a plasma cannon. That may not be enough, though. To deliver the final blow and pull away from your enemy, you may need to slow down to crawl, get in line with them and drop a depth charge to stop them in their tracks. Now you can floor it and take the lead for the remainder of the race. All of the above is done with your smartphone or tablet with a few simple controls. I should also add; you can steer your car by tilting your device left of right to move across the four racing lanes. Between the gameplay on your device and seeing the cars zip around the track is a lot of fun. Kids are sure to love it, and even the kid in all of us will enjoy joining in on the fun. You're dog may want to join in on the fun too! The quality of the track, cars, and app are all excellent. The track, as mentioned snaps together using magnets. Not once did I encounter any issues with it staying together, even when using the riser pieces to add a small hill to the racing environment. The cars are made mostly out of plastic, especially the outer body. I had no issues with their durability during my testing period, however, over time there could be cause for concern if you frequently use the collision figure 8 track setup or introduce the much larger, heavier Supertrucks into the mix. I do not think this is a major concern, but something to consider. Back to the track. I was amazed at how well the cars clung to the track. I recall growing up; I had a race car track that used remote controlled, motorized cars that held onto the track with the weakest of magnets. Every turn at high speed would send your car sailing off the track. This was never the case with Overdrive. With the tight turns, banked corners, and moderate collisions the cars stayed on the track. Even when the clipped the edge of the track, the AI was able to get you car back on track and remain in the race. Absolutely! The cost of this product may seem high when compared to other similar products, but the gaming experience and the intelligence of the AI-powered opponents make it worth the extra investment. There are also several ways you can add to the Overdrive fun by adding additional track pieces, other cars, and trucks which can inject new life into the product once the shine wears off. You can buy Overdrive starter kits addition Supercars or Supertrucks and accessories from Anki, Amazon, and Toys R' US. Meet Changer: "The Swiss Army Knife of Headphones"
Motorola Z3 Play Review: Third Times a Charm? #HelloMoto - Motorola is Turning 90! Anki Cozmo - New Version! !